Cy Twombly’s paintings and sculpture use apparently simple means to evoke ancient history and myth. Twombly studied in Boston, New York and at Black Mountain College in North Carolina at the height of abstract expressionism. He incorporated graffiti-like pencil scribbles onto the surfaces of his early paintings, introducing elements of hesitancy and fragility into the confident physical gestures of abstract expressionist painting. The three late paintings shown here take Bacchus, the Roman god of wine, as their subject. ‘To paint involves a certain crisis, or at least a crucial moment of sensation or release,’ Twombly wrote earlier in his career, ‘…it should by no means be limited to a morbid state, but could just as well be one ecstatic impulse.’ This impulse has made regular appearances in his work, often personified by Bacchus, whose rites were celebrated with orgies and the raw flesh of animals being consumed. Red is the colour of wine, but also of blood, and these canvases encompass both the sensual pleasure and violent debauchery associated with the god. This contrast is echoed in the paintings’ combination of euphoric loops that soar upwards and vermilion floods of paint that ooze and cascade down the canvas. The unfurling gestures of these paintings were made, like Henri Matisse’s works in old age, with a brush affixed to the end of a pole, which lends them their vitality and scale. The sculptures included in this room are all bronze casts of Twombly’s assemblages of found objects and detritus, such as the top of an olive oil barrel, which forms Rotalla. Through such simple parts, Twombly evokes classical artefacts, such as chariots and ships, while their casting in bronze lends otherwise ephemeral objects the permanence of ancient sculpture. 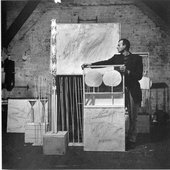 Cy Twombly (1928–2011) was born in Lexington, Virginia. He lived and worked in America and Italy. Curated by Nicholas Serota and Nicholas Cullinan.